I just began Tim Keller’s monumental new book on the problem of evil Walking with God through Pain and Suffering and it’s, well, it’s monumental. I’ve read a number of books on the subject, especially in my undergrad in philosophy, and I have to say, though I’m only a couple of chapters in, it’s going to be the new classic on the subject. Unlike other works on the subject, he’s not only pastoral, or only philosophical, or only theological, but he approaches the issue of suffering from all of these angles and more. Sociology, literature, theology, philosophy, and, of course, the Scriptures, are brought to bear on the seemingly intractable burden of suffering and evil. “The first relevant Christian belief is in a personal, wise, infinite, and therefore inscrutable God who controls the affairs of the world–and that is far more comforting than the belief that our lives are in the hands of fickle fate or random chance. The second crucial tenet is that, in Jesus Christ, God came to earth and suffered with and for us sacrificially–and that is far more comforting than the idea that god is remote and uninvolved. The cross also proves that, despite all the inscrutability, God is for us. The third doctrine is that through faith in Christ’s work on the cross, we can have assurance of our salvation–that is far more comforting than karmic systems of thought. We are assured that the difficulties of lie are not payment for our past sins, since Jesus has paid them. As Luther taught, suffering is unbearable if you aren’t certain that God is for you and with you. Secularity cannot give you that, and religions that provide salvation through virtue and good works cannot give it, either. Note clearly: this is no mere theism with general platitudes about everything working itself out, or karma, or what-have-you, but concrete consolation grounded in deep Gospel truth revealed in the cross and resurrection of Jesus Christ. Even the first doctrine of God’s inscrutable wisdom is one grounded in fact that Jesus was “delivered up according to the definite plan and foreknowledge of God” (Acts 2:23), for our salvation. Clearly we could expand on all of these (and Keller will), but these four thick truths of the Christian faith are the key doctrinal pillars upon which any properly Christian response to suffering will rest. This is how the Christian begins to deal with the problem of pain and suffering. Once more, this is why doctrine matters for real life. You and i seem to be in step here with reading as i have just begun this book as well and am already being seriously blessed and instructed by it. I found it really interesting to read about how different cultures/people in the past/present meet suffering and are prepared by their culture to do so compared with how unprepared we are as north Americans and unwilling/unable we are to deal with suffering at all. Can’t remember if Keller says this or not but it struck me how individualized our culture is as well as an over realized secular humanism that sees man’s enjoyment/comfort as the highest of ideals which then vilifies anything that might intrude upon that happiness as some likely culprits as to why. Looking forward to getting to these doctrines as well as the rest of the book. Yes, it is in the Keller book. He’s drawing on Charles Taylor and Christian Smith there. It’s just brilliant blending of good sources. 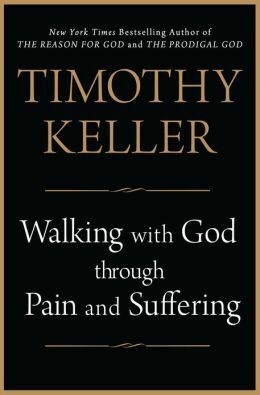 But I agree, Tim Keller has done a great job of addressing pain and suffering so far (I haven’t had a chance to read past the first chapter yet) and I am excited to read and learn from the rest of his book. His approach is honest and doesn’t skirt around the reality of pain, which I really appreciate. Thanks for sharing. I’ll check that out. I’ll be glad to see others interact with his work. It’s rich so far. Thank you for the post Derek. God is for us indeed. I really have a deep admiration for Tim Keller’s writings. “The Reason For God” is at the top of my re-reading list, and a real compliment to the likes of “Mere Christianity” and “The Faith.” Keep em coming! That book is good for a skim once a year. Excellent work. Hi. I know this is old, but I came here bc I’m struggling with Gods goodness and the existence of evil. I need urgent, intense prayer to have the humility to receive the truth keller presents. If you/any prayer warriors you know will lift me up and ask The Lord to save me and keep me and help me be willing to humble myself and trust him I would be so grateful. I will pray for you, Kathryn.